The grass is greener…. in California! Warmer days have me craving all the smoothies and missing my Vitamix! Today I’m sharing a twist on a favorite that was on repeat, a Pitaya Matcha Superfood Smoothie, before we headed out here. It was one of favorite way to brighten the snowy cold days back home. 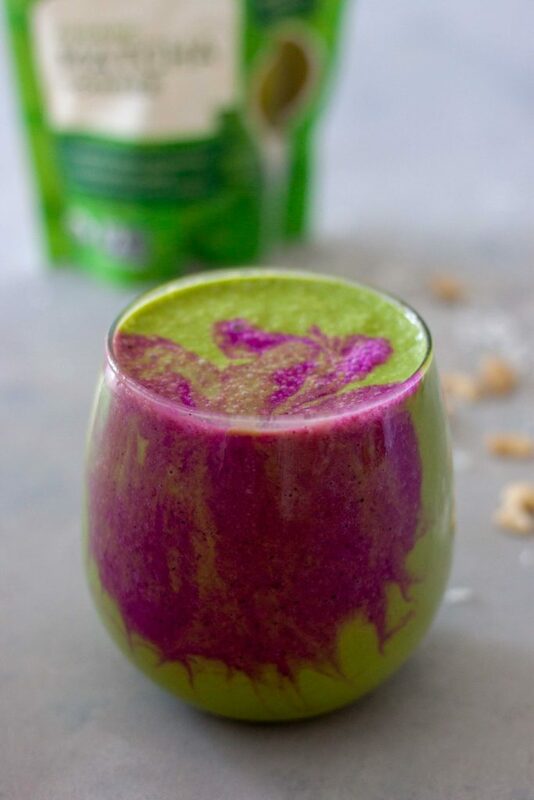 This Pitaya Matcha Superfood Smoothie nourish the mind, body, and soul not to mention tastes delicious! Energizing yet calming, crazy I know but just trust me, and what this mama needs! Smoothie cravings are nothing new for me, we make them year round even on the coldest snowiest days. 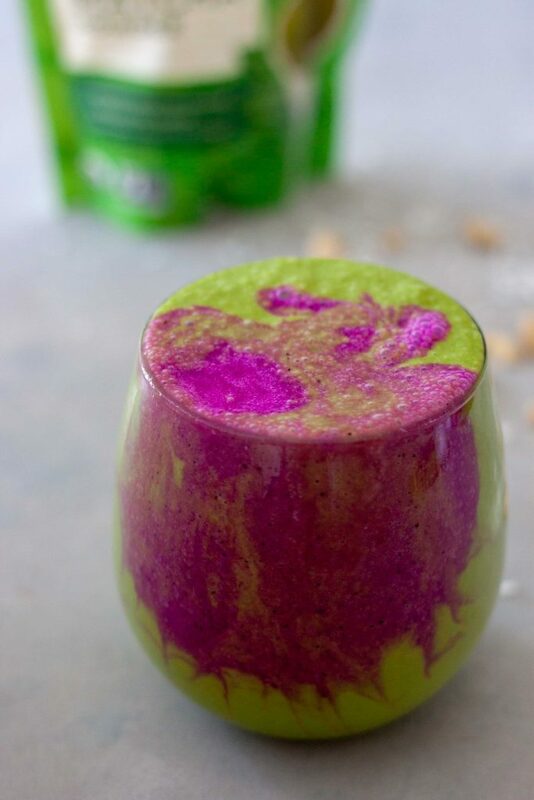 Neither are layered smoothies like this one and loving the color combo goes way back to before my Green Dragon Fruit Smoothie. 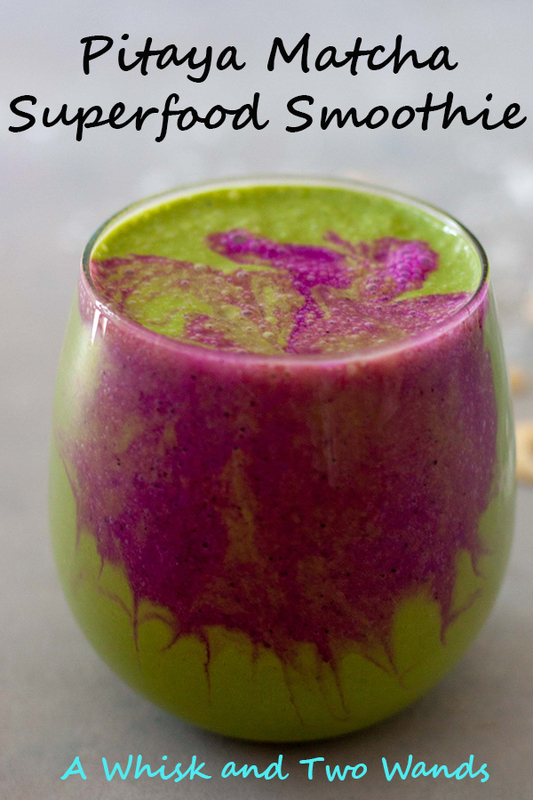 A more recent favorite that also uses pitaya (dragon fruit) is this Golden Goddess Smoothie! What is new is this year I’m trying to cut back on my afternoon coffee. Yes I said it, and I LOVE my coffee and no I’m not giving it up. I’ll still have a cup, or two, in the morning and sometimes in the afternoon but trying to stick to tea, kombucha (or kombucha smoothies), or a smoothie in the afternoons on most days if I need something. This smoothie however isn’t just an afternoon smoothie but it certainly powers through that afternoon slump and helps me get stuff done! 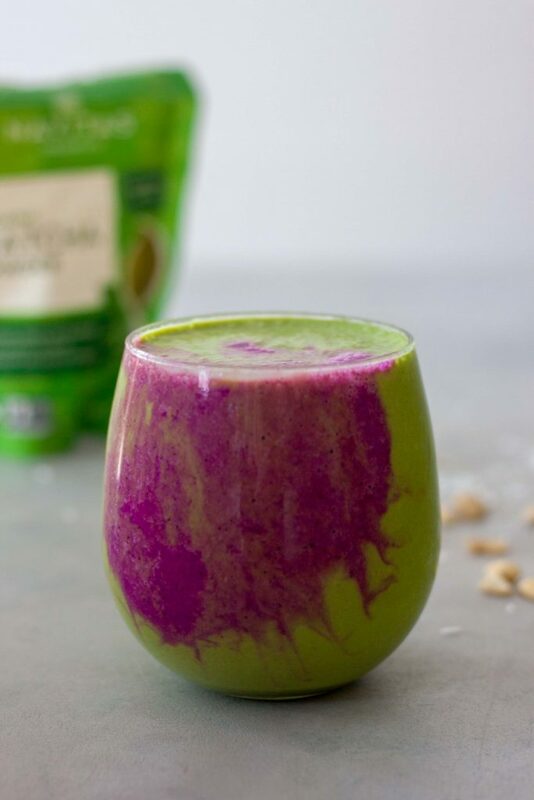 A very filling and satisfying blend of cashews, coconut, spinach, matcha, and maple water lightly sweetened with a date or honey. I like to soak my cashews but this is not required. I wasn’t for awhile but then found out I could soak them and then freeze them so I’ve been doing that to have them on hand for smoothies like this, it just makes them easier to digest. You can use cashew butter. This is a very adaptable smoothie so I’ve added notes and options for additions like protein powder, collagen, superfoods, and or adaptogens. Functionally everything I used as a purpose or reason. Maple water is high in magnesium, minerals, antioxidants, and electrolytes. It’s very refreshing and doesn’t have a strong taste just slightly sweet and is 1 ingredient, nothing added, and has less sugar than coconut water. Matcha is provides balanced energy (no crash like coffee) yet is calming at the same time. It also packed with antioxidants, about 10 times the amount of other green tea. Spinach to get those greens in! No explanation needed here I do like to use spinach over other greens for it’s sweeter flavor. Cashews for healthy fat and protein, yes protein! One ounce of raw cashews contains 6 grams of protein, as well as 10% of the daily allowance of iron. They also have a creamy flavor unlike any other nut which is probably the reason I would have to say it’s my favorite nut. Coconut or coconut butter for healthy fat (MCTs) and extra creaminess and filling effect. Date for a little sweetness and energy, otherwise I like to use local honey. I almost forgot the most exciting part, ok maybe not the most exciting but the brightest part, the pitaya! I really didn’t forget it but it is optional, but not really because it really makes me smile as I sip this smoothie. Pitaya, also known as dragon fruit, is rich in magnesium which helps with energy but also helps relax muscles and nerves (perfect post workout or afternoon when I am often more stressed). It’s also a great source of iron, high in fiber, rich in B2 and vitamin C (hello immune boost), and rich in antioxidants! Banana to make it creamy, add a little sweetness, and potassium but it’s only 1/4 of a banana. Optional ingredients you might add are collagen, protein, or superfoods/adaptogens. Sometimes I add maca or ashwaganda and as mentioned above maybe a scoop (serving is 2 scoops) of vanilla protein powder. All the nutritional benefits aside it’s delicious and makes me feel good! This smoothie made me realize I like my matcha creamy. Either with steamed dairy free barista milk and or blending in a scoop of coconut butter (simple to make at home and all you need is unsweetened shredded coconut, read more here), and sometimes collagen and adaptogens. 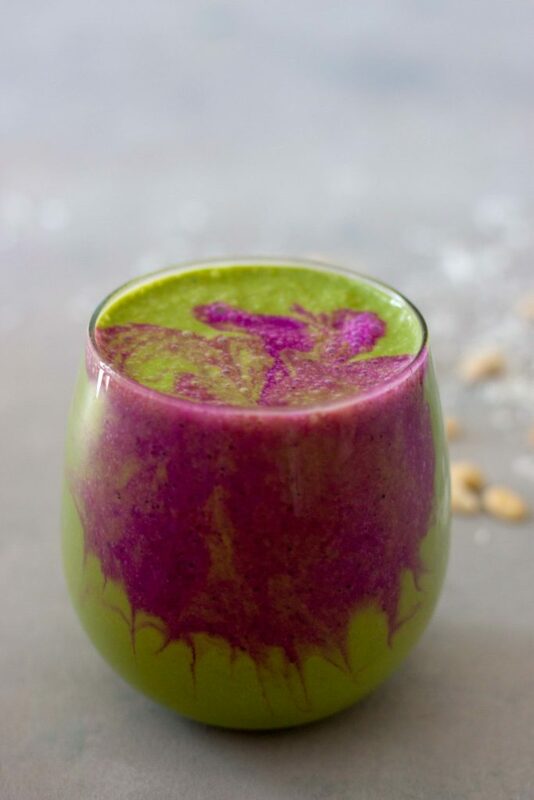 Depending on my mood and needs I’ve been switching it up with this Pitaya Matcha Superfood Smoothie, a matcha latte, golden turmeric latte, kombucha, or one of my grab and go elixirs and sometimes a small snack depending on which one I make. My days have been off lately and there are days I get my lunch later so I will often go for something like one of these options or another smoothie. This might be post workout and then I have a snack but don’t really have “lunch” or if we have an early dinner (like 4:30pm) before activities I’ll do this and then have a snack at night. Just listening to my body and doing what works for me and days when I have a smoothie like this I feel much better. This just isn’t a smoothie, most smoothies aren’t, something most people have in addition to a meal. Or that I have in the afternoon after having a big lunch and then a typical big American dinner. I don’t count calories I listen to my body but I just wanted to put it out there as you know your body and what works for you. I just often see people adding in a heavy smoothie as a snack when they still keep other meals big or add to their regular routine. I’m not focused on losing weight only fueling my body with nutrition and what it needs (still having my treats too). 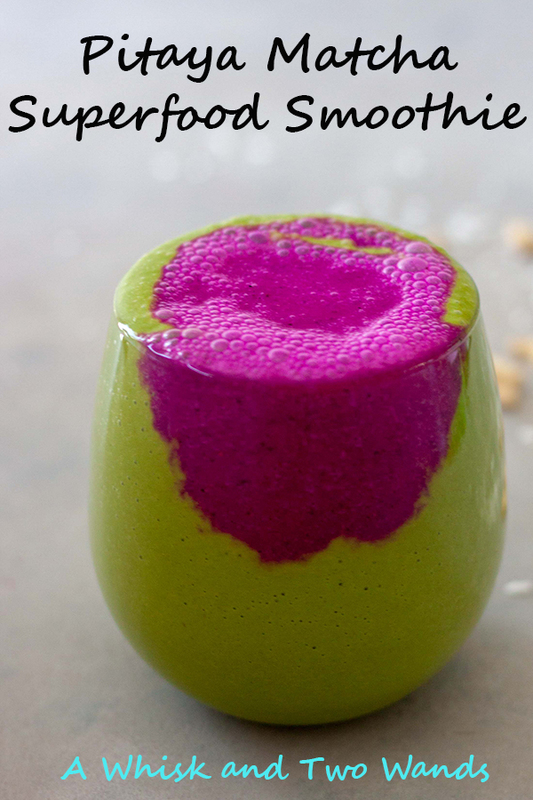 Creamy and energizing matcha smoothie layered with a bright pink pitaya smoothie come together in this Pitaya Matcha Superfood Smoothie that's sure to make you smile as you sip it! Dairy free, gluten free, vegan friendly, it's packed with whole food nutrition, superfoods, and optional additions. In a Vitamix, or high-speed blender, blend maple water, matcha powder, greens, cashews, shredded coconut, date, ice, and optional add-ins until smooth. Rinse blender, no need to wash. 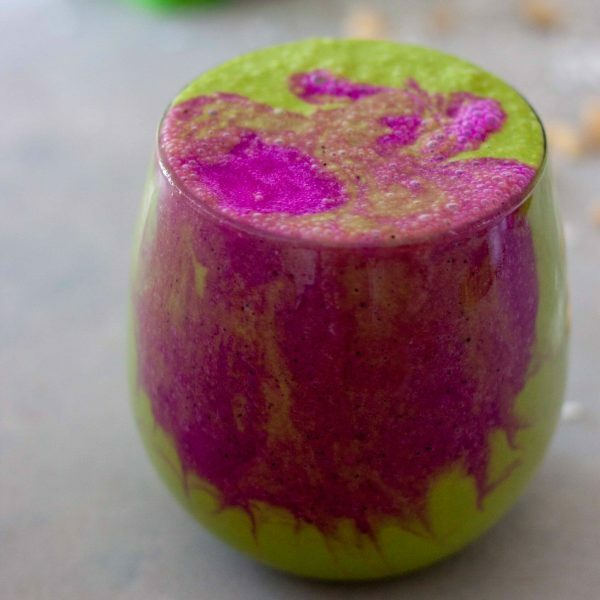 Blend pitaya, cashew milk, and frozen banana until smooth. Pour over top of the matcha layer. Sub cashew milk for maple water or vice versa. Or you can also sub coconut water for maple water. Swap cashews for 2 tablespoons cashew butter or 1 scoop of your favorite vanilla protein powder (I like Navitas Organics Vanilla & Greens in this smoothie). Coconut butter can be used in place of shredded coconut. You can omit the date and ice and use 1/2-1 frozen banana. I like to soak my cashews. This takes 4 hours, you can soak them ahead, rinse them, and then freeze them in the freezer. An ice cub tray helps to measure them out into tablespoon amounts. Deborah @ Confessions of mother runner recently posted…Hip Hop Hot Yoga? Namaste yes!